यह संदेश सभी को भेजने नम्र विनंती है . 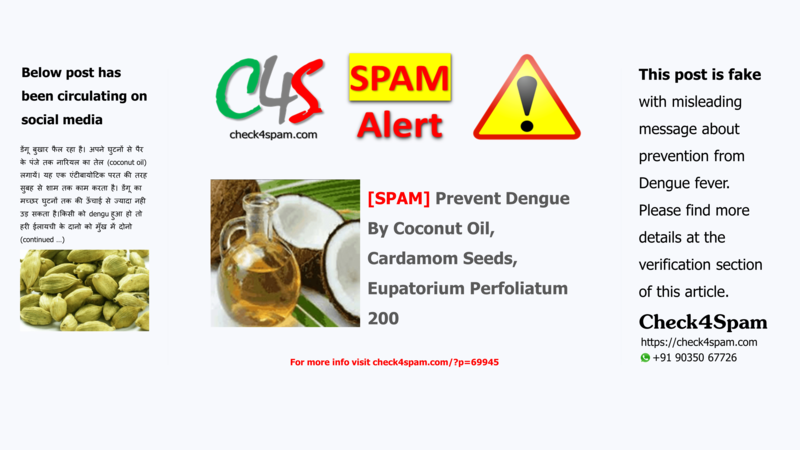 Verification: Applying Coconut oil upto knees and chewing Cardamom seeds does not give prevention from Dengue. Eupatorium Perfoliatum is a preventive Homeopathy medicine. When we receive such forwarded messages on our mobile or mail or in any other form, we tend to believe it as we all don’t want to get sick. But we forget to check the reality in respect to the message. How true is it, how factual are the claims, who sent it, should we believe it or not. That is the time not to get trapped in these kinds of malicious contents. Since few years people are being fooled by many fake news, messages, images and videos. This message is also going viral. There are many specialists in the world who can clarify medical queries we have in our day today life. Specially Internet made it super easy to get any kind of information at any time. So let us not waste time in believing and passing on such hoax and spread false information. Instead google it, find the fact, try and Check4spam. Now the claim about Homeopathy medicine EUPATORIUM PERFOLIATUM 200 as prevention. Yes It is used as medicine for Chikungunya and Dengue. Boneset has been widely used for ages in the United States for its maximized curing effects on dengue patients in 19th century thus getting its common name. The plant has many medicinal benefits, but the over dosage of it act as drugs and can cause severe diarrhea, hence it is also claimed as “Herb of Undefined Safety.” Boneset mainly contains sesquiterpenes lactones, a number of sterols, the flavonoids, glycosides and unsaturated alkaloids. There are various messages going around claiming cures and preventions to various diseases. Yes, some common day-today ailments are being taken care in our houses with grandmothers formulae. But when we suffer from something like viral fever or Dengue or any such illness, it is always advised to go to the specialist and take opinion and then further treatment. As the saying goes “Prevention Is Better Than Cure” is the first step to be away from many diseases. Cleanliness in our surroundings does make a big difference to us and our community health. We are the one who need to take initiative for this. Please don’t believe these kind of messages, it can lead to a dangerous circumstances. Take proper advice. Be clean, be healthy, be safe. Volunteer for cleaning events in your own area, spread awareness among children. These small initiative helps others to come forward and contribute to a healthy family and community.